Mac DeMarco’s latest, This Old Dog, is a 13-track album, and his first full-length release since Salad Days in 2014. Rather than write, record and produce in a short timeframe, DeMarco spent more time with this album than he normally does. Amid relocating his life to Los Angeles, DeMarco formed a deeper investment in the end product and the songs, creating a cohesive narrative album, rather than simply a collection of songs. As DeMarco explored the progression of life and music, This Old Dog became inevitably more personal to him and warranted some rewriting. The album adapts to his indie-pop style and feels like an extension of “Chamber of Reflection” from Salad Days with some neo-psychedelic rock elements. This Old Dog features an evolved DeMarco, using mostly acoustic guitar with a large emphasis on synthesizer, with only one track using the electric guitar. The album opens with “My Old Man,” the track most notably different from previous work. It hearkens to Kurt Vile’s moody and reflective acoustic approach. He traded his typical style for the new, but with this album, DeMarco gives listeners a first glimpse at his personal life. Simultaneously optimistic and forlorn, he sings, “Look in the mirror / Who do you see? Someone familiar / But surely not me / For he can’t be me / Look how old and cold and tired / And lonely he’s become,” as he realizes, “Oh no, looks like I’m seeing more of my old man in me.” DeMarco has a complicated family history but positively directs himself to look at “all the steps that brought you where you are today.” DeMarco maintains a sense of lyrical authenticity while journeying through an evolutionary instrumental shift. This Old Dog was produced with a focus on synthesized effects, but the album still maintains the base of the “Demo-Marco” style from former albums, simply with a new instrumental approach, recorded without his band. The album features DeMarco on drum machine, bass, acoustic guitar and even on the acoustic piano on tracks like “One More Love Song,” which he has never done before. 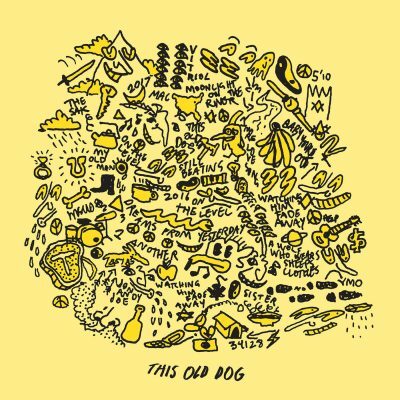 This Old Dog exudes musical depth and is, for the most part, slow-paced and dreamy, easily transitioning from one song to the next without any serious shift in sound or style. “Baby You’re Out” is the most cheery, upbeat song, with happy-sounding chord progressions, soft, quick drumming and a catchy, repetitive series of notes on the bass. DeMarco spends more time jamming than singing, especially on tracks like “Moonlight on the River,” which is a seven-minute song that layers the acoustic guitar and drums in the background of a long, trippy synthesized jam.